Congratulations to the winners of PR Daily’s 2016 Digital PR & Social Media Awards! We wanted to see your most inspired, thought-provoking and imaginative work in digital PR and social media. You took our PR Daily Awards to new heights with your fantastic campaigns highlighting “what’s next” in digital media and communications. What we saw demonstrated uniqueness, creativity, and most important, success. We saw the power that digital PR and social media brought to your brand, cause or product. We saw the appeal of your ideas to people in the most accessible form of media. 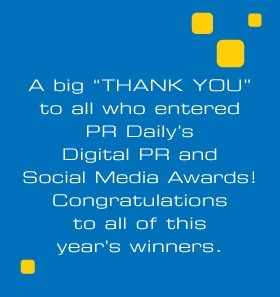 To everyone who entered this year’s Digital PR & Social Media Awards, thank you for sharing your campaigns with us. We are proud to announce below the winners and honorable mentions of the 2016 Digital PR & Social Media Awards with this Special Edition of PRDaily.com.